The Fall 2018 Act Six application is now closed. You can stay updated by following the selection process timeline! Semifinalists travel to the college for which they were selected for a two- or three-day event between January 25 to February 14. Phase III allows students to experience campus life as they participate in a four-part evaluation process that includes a personal interview, an on-site writing task, academic seminar discussions, and group problem-solving activities. A parent or guardian is invited to participate in a portion of the visit. For Whitworth and Gonzaga, air transportation, housing, and meals for students and parents are provided. Do you live in the Tacoma-Seattle area and, if selected, could you arrange your own transportation to weekly evening trainings in Tacoma and Seattle? Do you want to attend Gonzaga, Northwest, PLU, Saint Martin’s or Whitworth? Degrees of Change and the partner colleges you selected do not expect or require any faith commitment from Act Six applicants. We are, however, committed to exploring through Act Six an open conversation about spirituality as it relates to leadership and service in a diverse community. What role, if any, has your own faith tradition or spirituality played in your life to this point, how might it influence your values and vision for your future, and how do you feel about studying at a religiously affiliated institution? Scores from the SAT or ACT are required for admission to all partner colleges. Scores you have already received should be reported by your school in the High School Counselor Report form of your online application. If you are applying to any of these schools and your school has not received results by the application deadline, you may still apply for Act Six, but a copy of the exam score report must be received by the Act Six office no later than December 31. How well do you know the applicant (very well, well, casually)? Does the applicant know Christ as personal Savior and Lord (yes, no, unknown)? Does the applicant demonstrate Christ in his/her lifestyle (yes, no, unknown)? Please describe. Describe the applicant’s leadership ability (exceptional ability, good ability, makes some effort to lead, prefers to follow). What goals does the applicant have? What are the applicant’s strong points (including special abilities)? What is your opinion of the applicant’s level of social readiness for university life (highly enthusiastic, strong, moderate, hesitant, negative, no knowledge)? On a scale of 1 to 4 (1=low, 4=high), rate the applicant in the following areas: honesty and personal integrity, attitude toward schoolwork, emotional stability, attitude toward authority, ability to make friends, ability to adapt, judgment, dependability, concern for others. Further comments you may have regarding the applicant? Northwest University holds that certain standards of conduct are unfitting for a Christian (see Galatians 5:19-21). Do you feel the applicant would have problems adjusting to the University with regard to any of these areas (yes, no)? Offer your overall recommendation (recommend, recommend with reservation, do not recommend). Act Six sends scholars together to college with the built-in support and encouragement of a cadre of fellow leaders who share a common mission. Act Six is the only urban leadership award that offers unparalleled full-tuition, full-need scholarships. Since 2002, 814 Act Six scholars have received nearly $43 million in grants and scholarships. Act Six offers Tacoma-Seattle’s only full-tuition, full-need urban leadership scholarship. Act Six works with colleges and other partners to guarantee that full scholarship recipients receive grants that, at minimum, cover full tuition at the college for four years. Getting to college is just the start of the Act Six experience. Bound together by a shared mission and commitments, scholars learn to encourage and challenge each other while they receive ongoing support from their colleges and Degrees of Change. 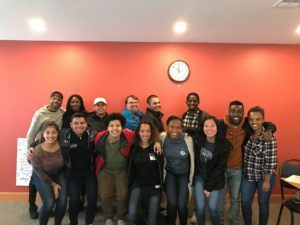 After five years together, alumni graduate from college connected to each other and ready to lead in the community. Together, they are weaving a fabric of leadership that will shape the future of our cities. Act Six staff operate out of deep Christian commitments–commitments that include genuine respect for those who do not share their convictions. With the exception of applicants to Northwest University, Act Six applicants are not required to make a statement of faith or consent to any doctrinal statements. They must, however, be open to exploring Christian perspectives on leadership and service and should be aware that a significant portion of the training program will be dedicated to this exploration. In the midst of this exploration, disagreement and differing perspectives are welcomed and engaged. Consistent with regular admission policy, applicants to Northwest University must complete an additional essay in which they describe their Christian faith commitments. No. U.S. Citizens, Dual-Citizens, and Permanent Residents are eligible to apply for Act Six at all five partner colleges. Immigrants who are eligible for the Washington REAL Hope Act may apply for Act Six at all partner colleges as well. Scores from the SAT Reasoning or ACT are required to complete your Act Six application. Scores you have already received should be reported by your school in the High School Counselor Report form of your online application. If you are applying to any of these schools and your school has not received results by the application deadline, you may still apply for Act Six, but a copy of the exam score report must be received by the Act Six office no later than December 31.